Scientists, environmentalists, green NGOs and corporations are all chasing the $1.5 trillion per year that feeds the climate crisis and renewable energy industry. The lengthy list also includes scientifically illiterate population-control socialists and Hollywood cause seekers, who are all supported by environmental journalists who never question any “green” causes or scare stories. Many use the “precautionary principle” to justify drastic actions that perversely have truly drastic consequences, intended or unintended. Eco-fanaticism has already pummeled Europe. In the past ten years, the price of electricity in Europe has climbed by an average of 63 percent. Polling indicates that 38% of British households are cutting back essential purchases like food, to pay high and rising energy bills. Another 59% of homes are worried about how they will pay energy bills when the Paris accord is enforced. Poor and middle class families are impacted worst of all. Families and businesses in the “Blue States” in the Northeast already pay the highest electricity prices in the United States – twice that of some other states. The changes the EPA and this administration are pushing could double those rates – and the rates in other states. 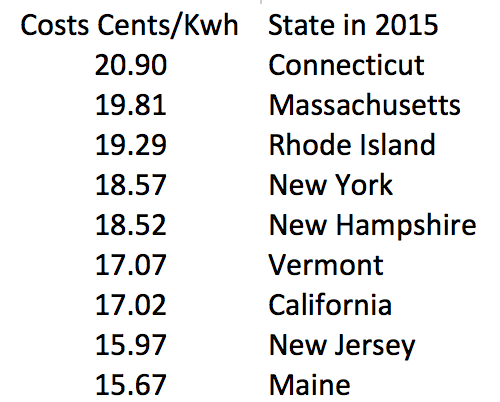 Followng are the top ten states (of the lower 48) for 2015’s average residential electricity costs (Source: EIA, May 2016. ). The thousands of dollars that an average Northeastern family saved on gasoline and heating oil in 2015, thanks to fracking and drilling on private land, was truly welcomed as the only “raise” that many families got in many a year. However, that too will be a memory, if the EPA’s plans are not blocked by the courts – or a President Trump. Moreover, if elected president, Hillary Clinton and Bernie Sanders both plan to eliminate fracking, as well as most conventional oil and gas drilling and production. Moreover, soaring energy prices ripple through the entire economy, affecting the cost of all goods and services – including products and services provided by factories, hospitals, schools, small businesses and the shipping of food and other products. Soaring energy prices kill jobs and depress living standards, as companies and communities find they must come up with thousands to millions of extra dollars every year, just to keep the lights, heat and air conditioning on and machinery humming. Our aim is not to save the world from ecological calamity but to change the global economic system…. This is probably the most difficult task we have ever given ourselves, which is to intentionally transform the economic development model, for the first time in human history. It is implausible that Exxon, or CEI, or any other group or individual, for that matter, KNOWS or KNEW facts about catastrophic anthropogenic climate change that the consensed climate science community does not KNOW now. The consensed climate science community does not KNOW that anthropogenic emissions will cause a climate catastrophe, though they profess to BELIEVE that to be the case. It is critical, going forward, that the courts clearly distinguish between what is KNOWN and what is merely widely BELIEVED by adherents to the secular religion of climate catastrophe and their enablers. Models based on estimates can hardly be expected to provide revealed truth as output, though the modelers and the adherents to the secular religion of CAGW are certainly free to believe otherwise. I wonder if swimming pool companies could be sued under such a standard if there are memos about drowning–same for car companies about crashes. What MIGHT happen cannot be a base case in these instances. It never crossed my mind that I might live to see the day when a President of the United States intentionally damaged the economy. It never occurred to me in my wildest dreams that a bona fide national candidate for that office would campaign on a promise to do intentional harm to the economy and not be seen as a dangerous crackpot and lunatic. It astounds me to realize that the voting public is even dumber than Mencken thought they were. For clarification: The term “cost of electricity” means the sum of several different costs. In the above listed state of Connecticut, where I live, the cited 20 cents is consists of 2 cents wholesale price, 9 cents delivery charge combined with various “green” charges, and 9 cents for the actual electricity delivered. Thus 20 cents. Only the 10 cents is the energy and its production cost. And it varies throughout the year. In 2015 for example, it was 13 cents (AMJJ) and 8 cents ASOND). The distribution cost is independent of the electricity cost and both costs are subject to politics. As we know, utilities are “allowed” to charge and we the users are paying all kinds of hidden costs in the final bill. The bill amount is not a reflection of the cost a free enterprise would charge. Please tell your “green” friends that wind and solar will start compete when their electricity sells at the above 2 cents rate. The cost of “electricity” is actually only a small part of the cost he quoted, as I tried to explain previously. To illustrate the importance of these varying charges hear this. When the “renewable energies” charges were added to my monthly utility bills two decades ago, I refused to pay for that “green” subsidies item. Soon I was informed that if I do not pay the whole bill I will simply be charged the usual monthly interest. If, on the other hand, I pay the bill sans the “green” charge, I will go to jail. Apparently it is a state law. So, avoid the term “cost of electricity” if you mean the amount on the monthly bill. It is actually rather difficult to find the true “cost” when you consider that the cost is “regulated” by a regulatory body acting sometime for political reasons. I think were thinking about the same concept but lets be sure. For the purpose of consumer economics decision-making, I suggest that “consumer marginal energy rates” (CMER) are the correct term-of-art. This approach specifically evaluates the cost of energy as it is reflected by changes in consumption as it is billed per actual utility tariff sheets. If Glen Schleede reads this, he will recall the lengthy debate of this concept within DOE the decisions made and DOE neglect thereof. Anybody whose IQ is higher than their body temperature knows AGW is a scam. What are the so called climate scientists claiming? They claim they can predict the future and control the climate. These are extraordinary claims so I would like to see some examples where they have successfully done this. They can’t provide any.